Sign into Goodreads to see if any of your friends have read Hillbilly Elegy. Elyse, tomorrow I'll fetch my copy from my favourite bookstore, and am full exited to be able to read it. I'll be getting to this one as soon as I can lower my "shelf" Elyse. Hope you're enjoying this! Elyse, I'll be starting this soon (I HOPE), so I'm not going to read your review until ... well, you know. So glad to see you loved it! I loved your review. I've been meaning to read this book, but I'm a little worried about how he portrays Kentucky. Does he make us all sound like toothless hicks? Or is he fair? Wonderful review,Elyse! Have it on hold. Great review. Elyse! I thought the close relationship with his sister (and how he loves her children) was a particularly nice aspect of the book. His forthright personality came through clearly through the text, but I imagine that listening to him tell his story via audio book was even better! I'm glad you enjoyed the book. #1) IF ----anyone goes to College --they sure don't go far....(he had a great catchy quote about it) --I was going to write it down and remember it --but darn --with audiobooks --its so easy to just .....keep on listening ....then forget to get back to funnies -favorites and insightful sentences. 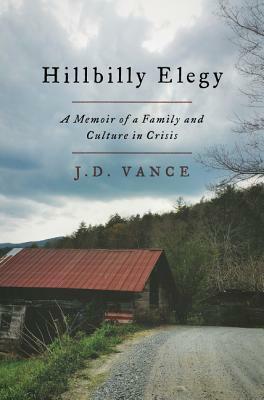 ...........Mostly --I thought Vance shared about HIS family --which is why I call this more a STRAIGHT memoir --and not TOO much about a culture-in crisis ----(because we didn't get to hear from other people) ---He 'could' have invited other speakers on his audiobook from his childhood days to speak. I've seen other authors do that --and its powerful. When you read through ALL the reviews --you SEE and FEEL how this book has touched people --and THAT'S worth talking about IMO! linda wrote: "lol fetch my copy (dean)"
His voice added to his own story! I could feel when he was 'really' into a memory that he would 'never' forget. debra wrote: "Wonderful review,Elyse! Have it on hold." Cheri wrote: "Elyse, I'll be starting this soon (I HOPE), so I'm not going to read your review until ... well, you know. So glad to see you loved it!" EVERYONE .....check it out!!! Its VERY ADVANCE MEDICINE!!! WOW!!! Good to know. As a Kentuckian I'm sensitive too how we are portrayed. I probably will read it. Thanks Elyse. A perfect example of why one shouldn't judge a book by the cover...or the title! Melora wrote: "Great review. Elyse! I thought the close relationship with his sister (and how he loves her children) was a particularly nice aspect of the book. His forthright personality came through clearly thr..."
but his voice was kinda 'addictive' (he's very charming in personality) --in a kind way too. Cheri wrote: "Elyse, you never fail to put a big smile on my face. Love you! xoxo"
smiling back at ya Cheri! The title of this book would have naturally had me look another way. So - I was sure I'd skip out again -- hell its not as if I don't have enough books to read, but..
Then the REVIEWS were not all the same any longer ..
IS THIS BOOK MAKING A DIFFERENCE? I'm not sure... time will tell I suppose. But listening to him speak - was engaging in a walking - meditative- thinking way. Good walking companion. Sometimes it got TOO HEAVY though his stories -- I wished for them to stop. A normal mother doesn't try to speed in a car to try to kill herself and her child... and tell him that's her plan. Scary scary day!!!! You can FEEL these readers wish to god to make a difference in our culture!! Ok, I'm sold, Elyse. I've hummed and hawed about this one but will give the audio a try. By the way, I'm listening to Just Kids right now and it's fabulous as an audio. You might drift a little at the start -- and takes a few minutes to get used to his voice, as he talks fast but then you really like it ... love to know what you think. Erin wrote: "Good to know. As a Kentuckian I'm sensitive too how we are portrayed. I probably will read it. Thanks Elyse." Elyse you are just the sweetest. Erin wrote: "Elyse you are just the sweetest." Elyse, I always feel like I have to catch my breath a little after reading your mile-a-minute reviews! I have not even heard of Pure Genius... Netflix? ...so I have no answer, is Bunkerhill Hospital part of Pure Genius? So confused! Was that better my lovely bicoastal-- lol -- friend? I thought you'd get a kick out of the location -- and 'especially' the SHOW itself! It reminds me of seeing some of the ideas in that book come to life! Elyse wrote: "Oops the above comment is FOR CHERI"
I knew that!!! Will see if I can find the past episodes somewhere... Thanks, I'll check it out. Hope your date night was wonderful! Cheri... and have a great weekend. xo. Jan .... right? Rather than his leadership advice of how to change anything? You two have been hand pick for the job -- such a positive difference you both make!!! Ach, Elyse, another comment by you that I didn't get a notification of! Jan...no problem... I can't keep up these days myself .. I thought my new system would work.... and it does in many ways - for me- but it's not a perfect science. And... I'm getting a kick out of seeing old comments here. I was telling Cheri about a new TV show call Pure Genius. It's true I do that sometimes. Paul and I are still loving "Pure Genius". It's gotten better since it started. Paul even had tears in one of the episodes. Love your review, Elyse. I did not want to read the reviews before I read it myself, although two reviews inspired me to read it. Well, I've just read the book and it was such a great discovery. Thanks Margitte... I read so many reviews on this book, plus our local book club discussion was packed that day. Thank you, and now I'm going to zip over to your review. Elyse - someone just emailed me and told me she read this book recently. However also today I began to think about utilizing more of my driving and walking time and getting myself an audible book - this may be the one. I am sad to say I lived in western KY two different times - the first for 1 1/2 years and just recently for 6 years - and we have been over to eastern KY but not into the poorest of the poor areas. My church always had 8th graders from school heading over 3-4 times a year to help in rebuilding their homes and there was a never ending need for food and supplies that we were always donating to. So with saying all this I want to listen to this book based on your review. I always rely heavily upon them and am always appreciative of the time you put into them. Now the challenge will be to get this from our library!!! I am going to see JD Vance on Thursday and I can't wait! he is coming to Pittsburgh so I am super excited! Just picked this one up at my local library today. Can't wait to dive into it! I am uploading my review of this book now--check it out.